Development, in evolutionary terms, refers to the process by which a fertilized egg develops into the adult form. By adult form, I don't mean that the organism has reached the age of majority and is heading off to college — or, for that matter, has reached sexual maturity and is getting ready to set up its own pride on the Serengeti. 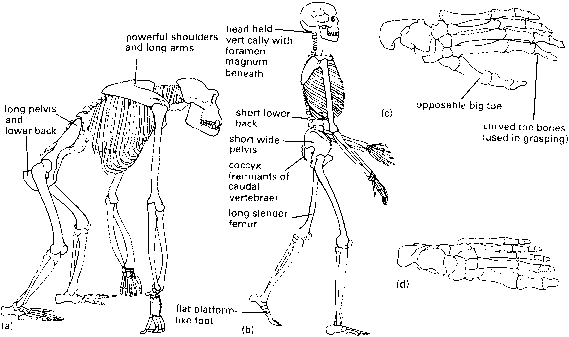 In evolutionary terms, development ends when the organism has all its parts, that is, when it has its final shape. In this context, adult doesn't mean grown up. 1 Cell division: The process whereby one cell splits into two, two into four, four into eight, and so on. 1 Differentiation: The process whereby one lineage of cells gives rise to different types of cells of another lineage, such as a skin cell or a heart-muscle cell, or any number of other types of cells. The embryo stage starts with the first cell division and goes until the organism has all its adult parts. This stage doesn't end at birth (most animals aren't born, but develop from eggs outside the mother) but at some time before birth, when all the parts that will be recognizable in the adult organism have formed. The organism has legs, eyes, all the various internal organ systems, and so on. As you can imagine in complex organisms such as mammals, pinning down exactly when the embryo stage ends is difficult. The key is that you know it when you see it: The developing embryo looks like a little version of the adult organism. Humans have a lot more names for various stages of development. In human reproduction, you hear the terms zygote (to refer to the fertilized egg), embryo (to mean any stage of development before birth or the particular early stage of development), fetus (to refer to later developmental stages), and pain in the keister (to refer to the teenage years). Don't let these alternative uses confuse you. In this chapter, the term embryo refers to the developmental stage from the first cell division to the formation of all the adult parts.